Ambulatory monitoring (Holter monitoring and event recorders) is done to record a patient’s ECG for a prolonged period of time, on an outpatient basis. 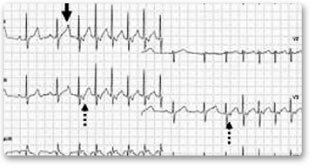 The purpose of ambulatory monitoring is to look for evidence of transient cardiac problems – that is, problems that come and go, and that are not apparent when a standard ECG is performed. Ambulatory monitoring is particularly useful in diagnosing transient heart arrhythmias, and transient cardiac ischemia. Holter and event monitors are medical devices that record the heart’s electrical activity. Doctors most often use these monitors to diagnose arrhythmias (ah-RITH-me-ahs). Arrhythmias are problems with the speed or rhythm of the heartbeat. During an arrhythmia, the heart can beat too fast, too slow, or with an irregular rhythm. Holter and event monitors also are used to detect silent myocardial ischemia (is-KE-me-ah). In this condition, not enough oxygen-rich blood reaches the heart muscle. “Silent” means that no symptoms occur. These monitors also can check whether treatments for arrhythmia and silent myocardial ischemia are working.